What Business Owners Should Understand About Wildfires | The Voss Law Firm, P.C. Wildfires Are a Real Threat for Business Owners in the Western U.S.
Posted on 07/18/2015 Wildfires Are a Real Threat for Business Owners in the Western U.S. Wildfire season is in full swing in the United States, and there are currently fires burning in multiple states. The Insurance Information Institute (III) has published statistics on its website that show there have already been 21,648 wildfires in the Unites States between January 1 and June 1 of this year. And, unfortunately, the season isn’t over yet. If you own a business in a state that is currently experiencing out-of-control blazes this summer, here are some things you should know about the risk of loss and your potential coverage in a wildfire catastrophe. When Are Wildfires a Risk? Although some states are more prone to wildfires than other, wildfires are still a risk in 38 of our 50 states. The biggest risks come in the warm-weather months—between March and September—when hot weather and low rainfall can dry out prairies and forests. Wildfires are more difficult to control when there are high, gusty, or unpredictable winds. What Are the Risks for Business Properties? Direct flames. 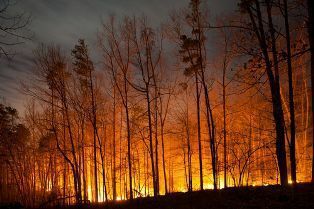 The course of an out-of-control wildfire can be difficult to predict. While many wildfires never encroach on populated areas, even one or two major fires hitting a community each year can be tragic. Businesses, especially those in tightly packed neighborhoods, can be completely destroyed literally overnight. Flying embers. According to the III, the embers of a fire that are blown by the wind are a significant risk, and are the likely cause of many structure fires. Embers and burning material can be blown onto roofs, through windows, or into nearby brush. When strong winds are present, fires can spread aggressively through blown embers. The heat of the fire. Even when a brush fire burns near a structure without spreading, the intense heat can melt siding, break windows, and warp building materials. Heat from the fire can also create issues with compressed gases, storage tanks, electronics, and other equipment. What Are the Rights of Commercial Policyholders? Most commercial insurance policies cover properties that are damaged by fire or suffer fire-related losses, including interiors, exteriors, supplies, equipment, outbuildings, and more. Most business policies also provide coverage for smoke and water damage related to a blaze. In many cases, the policy also covers the costs of business interruption and temporarily relocating a business that is destroyed by a wildfire. However, not all fire insurance policies are the same, and a lot can depend on the type of business you own, where you are located, and the details of the coverage you carry. If you’re unsure how or when wildfire losses are covered for your business, it’s time to carefully review your policies and start asking questions about your rights—before a disaster strikes. Are you having trouble with a commercial wildfire claim that has already been delayed, denied, or underpaid? If you need help with a difficult insurance claim for your business, don’t hesitate to reach out to our experienced policyholder attorneys at 1-888-614-7730.